Teresa is the only Ebola survivor of her village King Robert Farm, a suburb of Monrovia, Liberia. She contracted Ebola on 7 October and was sent to an ETU and got discharged on 20 October after her recovery. She is married and has 5 children. Her husband lost his job after the company he was working for found out she had Ebola. The Ebola outbreak in West Africa has produced increasing circles of victims beyond the infected and the dead. Survivors, families, children, and health workers are dealing with the stress and trauma left behind by the disease. 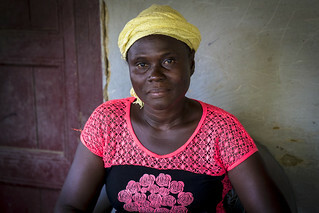 Psychological and social support is an approach that helps victims of Ebola to cope with stress and fosters resilience in communities and individuals affected. A team of 4 social workers and a supervisor from the Action Contre la Faim (ACF) visit twice a week residents in some areas on Montserado including here in King Robert Farm to meet the only survivor in this village and affected families. The UN Mission for Ebola Emergency Response (UNMEER) has provided ACF 9 cars to help it with logistics in reaching communities for contact tracing work and social work.